Enjoy the convenience of instant hot water with push button ignition. 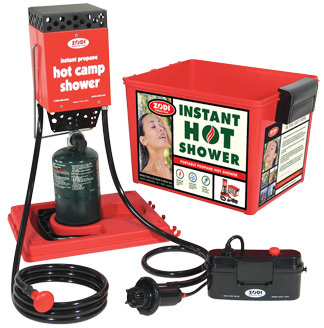 Equipped with a stainless steel burner, this Zodi shower provides endless hot water in just seconds. Includes a rugged plastic case that doubles as a 4 gallon water container. The powerful 6v water pump delivers great water pressure. The Traveler is ideal for canoeing, kayaking, family camping or anywhere lightweight and portability are required. The compact Traveler stows easily and provides about a 25 degree temperature gain per cycle. If the water source is lower than 65 degrees it may need to be recycled in a bucket for a few minutes to reach shower temperature. Weight 11 lbs, Box size 15" x 11" x 11"